Looking to attract trade show visitors at OTC Houston? HexaGroup developed a multi-market, multi-lingual, multi-audience, and multi-platform O&G trade show solution. 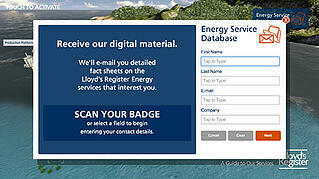 Looking to enhance their engagement in trade shows and improve lead collection, Lloyd’s Register Energy needed a marketing tool that could connect with their customers and serve their product offering in any given situation. Learn more about how HexaGroup's “Chameleon” platform helped Lloyd’s Register Energy connect trade show visitors with their product offering. Download the case study!